As career professionals, we at ECS know that relationships between students and faculty are critical to students’ success both inside and outside the classroom. Below please find some specific examples of how we can partner together to support you and your students in their career development and address the most common career topics that may arise in your conversations with them. We know you have great ideas, too, and welcome your input on how to tailor these programs to best meet the needs of your students. ECS’s career counselors coach students on every stage of the career development process, from preparing for networking opportunities to searching for jobs and internships. Encourage your students to schedule an appointment or stop by for a 15-minute drop-in appointment. You can also refer students to ECS right from your department or program website. Consider adding a link to ECS on your departmental website. ECS collaborates with programs and departments to customize events and workshops to address the specific needs and interests of your students. ECS offers skill-building workshops and classroom lectures on a number of career development topics, from resumes to networking to internship search. Please contact your ECS Liaison or request a workshop here. We also work with student leaders and groups on programming. An ECS Career Studio is an interactive and dynamic space where students can work on their career! An ECS Advisor will come to your location and coach students while they work on career-related activities. Students can bring their laptops, resumes or other materials and stay throughout the event. As the host, you’ll only need to reserve a room and help promote the event, ECS will do the rest! Want to hold a “themed” career studio, we can do that too! Some topics we might suggest: Resume Reviews (students will bring in their resumes and work on them or have them reviewed by ECS), Prepare for the Career Fair, or Elevator Pitches. Presenting at a conference? Can’t make it in to class? If you are unable to teach a class, don’t cancel that class! Instead, have ECS fill in. We can present to your students on our services, major-specific topics, resume-building and more! Request a presentation now. Does your student organization need to know more about career services, resume-building or conducting an effective job search? We’re happy to help. Request a student organization presentation now. Would you like to hold a meaningful and valuable professional development event for your RSO? Helping your members put their best foot forward will make a lasting impact on their futures. And nothing is more important than a powerful resume! ECS now brings resume review to student groups or to departments for special events! The Review Me team is a highly trained group of peer reviewers who will conduct free resume reviews at your time and location with your participants. Schedule your event now! ECs will come to your department to host drop-in advising for your students to review resumes and address other individualized questions. To take advantage of this programming option, please speak with your liaison. 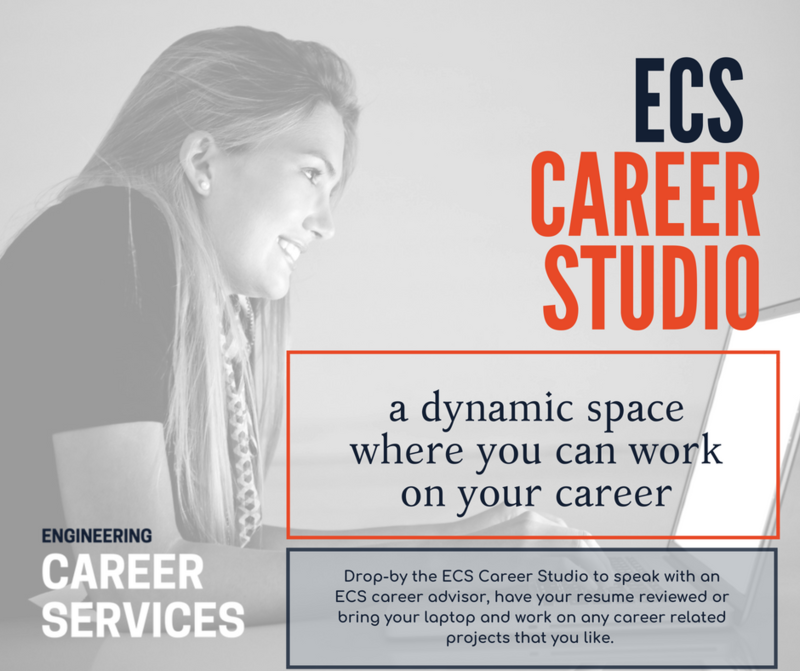 The ECS Career Studio is an interactive space where students can work on career related tasks with the assistance of an ECS advisor, whether it’s editing a resume, drafting a cover letter, or walking through LinkedIn to learn how to connect to potential employers. Students are invited to stay as long as they like and work on as many projects as they want to during the Career Studio hours. We can arrange to hold Career Studio events in your department or at another convenient location for your students. To receive our ECS newsletter or to become an ECS Campus Partner, please click here. Faculty and staff may request workshops to be presented to your audiences. If you would like to request a workshop, please fill out this form.